Luca Pani MD and Silvia Cammarata Pharm. D.
Italian Medicines Agency (AIFA) Rome, Italy. Hepatitis C Virus (HCV) infection is a heterogeneous disease which is estimated to affect up to at least 1,2 million people in Italy. Indeed, of all European countries, Italy is thought to be the one with the highest number of infected individuals. Moreover most of them are undiagnosed. As HCV may be considered a silent epidemic posing a national and global public health problem with serious consequences, we chose to approach it from multiple perspectives, considering also the ethical implications of an effective but too highly priced cure with all the consequent impact on sustainability for one of the few fully publically funded national health systems like the Italian one. Undoubtedly, some of these new drugs such as sofosbuvir represent innovative therapies, but other molecules and fixed drugs combinations have already been approved in Europe and in the USA or have received a positive opinion from the Committee for Medicinal Products for Human Use (CHMP) of the European Medicines Agency (EMA). As far as HCV infection is concerned research and clinical trials are showing significant effective benefit/risk profile for interferon-free short-term (down to 8 weeks) treatments that will, most likely, result in greater adherence due to better tolerability and overall cost reduction for non-pharmacological support for these patients. In Italy, sofosbuvir was approved with AIFA directorial resolution on 12th November, 2014 (“Determina 12 November 2014”), and six categories of the most severe patients were granted totally free of charge reimbursement status on 6th, December2014. The Italian national health system is facing a cost for the pharmacological treatment of HCV infections with new compounds (telaprevir and boceprevir included) of over 850 million euro in the period 2013-2016. Our commitment to ensure progressively full coverage for all patients in need of this type of therapy will require rigorous choices in the evaluation of innovation and added therapeutic benefit, in order to accurately identify the criteria for progressive access to medications and a strong post-marketing registry based on on-line monitoring of the efficacy and safety profiles in clinical practice to be included in the pricing negotiation. Reconciling the evaluation of innovation with widespread access to new drugs while trying to maintain overall sustainability of the entire system is a difficult task, especially in a situation where the Italian national health system covers the costs of all essential drugs and more than 70% of the total national budget for drugs (19,9 billion euro /annually ) is paid by the State which continues to provide universal health care to all. A strategy of expenditure restraint which all Regulatory Agencies have been trying to implement to date, has been based on fierce negotiation of starting prices (not very successful) and a cost/volume agreement (more successful in some European countries) considering that eradication of HCV infection should finally result in a contraction of the cost for global health assistance for this disease. With this in mind, during the negotiations for sofosbuvir, AIFA has taken – into consideration right from the beginning all the other new drugs under registration , thinking that their costs would be largely influenced by sofosbuvir’s reference price and most importantly by price volumes discounts. The AIFA strategy, under the direct auspices of the Health Ministry, was designed to lay the foundations for an ambitious pharmaceutical plan with the goal of eradication of HCV infection in 6-8 years in Italy. In order to achieve such an ambitious task AIFA inaugurated a new negotiating strategy choosing to undertake a public and transparent dialogue involving all the main players: patients, physicians, scientific societies and manufacturers. Furthermore, AIFA has involved other European National Agencies with the aim to identify and learn shared strategies, evaluating the opportunity to try new models capable of facing the changes in the global pharmaceutical scenario, following a scientific-regulatory-economic and a social ethical approach. Given the exceptional nature of the case and the improvement seen in the efficacy/safety profile of these new drugs (not only sofosbuvir) leading to possible eradication of the disease, even before starting the negotiation process with the MAH, AIFA adopted a number of extraordinary procedures, bringing together for the first time in joint session its two Committees [The Technical Scientific Commission (CTS) and The Prices Reimbursement Committee (CTS)] and calling for an additional extraordinary meeting session outside the scheduled agenda. The risk of neoplastic progression during the stay on waiting list is sufficiently low to ensure a permanence time on waiting list congruous with the chance to get the most benefit from antiviral therapy (at least 3 months). Chronic hepatitis with extra-hepatic manifestations HCV-related clinically relevant (e.g. symptomatic cryoglobulinemic syndrome moderate to severe or lymphoproliferative syndromes), regardless of the degree of fibrosis. Meanwhile, starting from a significant (albeit not publically disclosable) cut in price for sofosbuvir the negotiation process of other medications related to HCV infections such as simeprevir and daclatasvir has been completed. Indeed the agreement reached on the cost of treatment and on reimbursment admission procedures for simeprevir was also particularly innovative for the Italian national health system and again represented a first time for AIFA. In order to ensure economical sustainability the negotiated agreement was based on a procedure of de-listing from the same company of drugs which shared the same therapeutic indications such as Telaprevir, for which the agreed cap limit for the last 24 months had not been already reached. So after guaranteeing the continuity of care for patients already under treatment with telaprevir, the drug was excluded from reimbursement while its remaining resources were redirected to cover the treatments starting with simeprevir at no additional cost for the Italian national health system until the original budget for telaprevir would be reached and when a mandatory renegotiation for simeprevir would start again. This situation will not only allow to treat patients with a drug that has shown increased efficacy and better tolerability compared to telaprevir, but it will also ensure that the Italian national heath system will reimburse the therapy with the best cost-benefit ratio, simultaneously facilitating the economic coverage of the new treatment and a more efficient allocation of resources. Most importantly this agreement set a legislative precedent in negotiating managed entry agreement for the Italian system and it was repeated once again for the combination sofosbuvir-ledipasvir at an even a better volume price discount than that for sofosbuvir alone and, again, with no impact on the Italian national health system’s budget. It must be said that the approach that has allowed AIFA to close a swift and successful negotiation for the reimbursement of sofosbuvir, simeprevir, daclatasvir and sofosbuvir+ledispavir, within the deadline requested by the Ministry of Health to assure the treatment of the largest possible number of patients, has been made also possible – unfortunately – by the high prevalence of HCV infection in Italy, that allowed an “aggressive” correlation between the two parameters (price and volume), starting from an average price of €37.000 Euro per patient, which is generally lower than the rest of Europe, with further rebates directly linked to the sold drug quantities at a non-public price. The progressive criteria of appropriateness have been specified by the CTS, after carefully considering the point of views of patients and specialists. Despite favourable average and final prices for all these drugs, global spending remained significantly high which is why, through an amendment to the Italian “ Stability and Growth Pact law”, the Ministry of Health obtained the allocation of a specific innovative (not only for HCV drugs) fund of one billion Euro for the next two years with an aim to start the desired process of eradication of the disease from the Ministry of Finance and Economics. Moreover considering that, with the mandatory genotyping for these patients, we are entering the precision medicine era and the task of Regulatory Agencies is to offer real innovation with more effective and targeted therapies, AIFA intends to evaluate all of them with an on-line regulatory registry to gauge both therapeutic efficacy, risk- benefit and benefit-cost ratio in real-life context use. Given all the above reasons the authorization of sofosbuvir, simeprevir, daclatasvir and sofosbuvir ledipasvir contemplates a continuous, real-time, monitoring system through a common register that has been designed in collaboration once again with internal and external experts. Nevertheless, if on the one hand we have to limit expenditure to those in real need we cannot close the doors to innovation let alone to the hopes of the sick. In Italy, the Ministry of Health has established criteria for distribution and has determined the conditions of eligible patients; at present, the local authorities (Regioni) are identifying the facilities through which the drugs will be made available. From our personal experience it seems preferable to start “joint negotiations” between European Countries’ Payer Authorities and MAH in order not only to standardize the evaluation and the recognition of innovation but also to obtain better price agreements on a much larger population of patients. Italy has proactively been promoting this type of initiative despite the limited time available for anti HCV infection drugs, a European joint-procurement procedure has not been finalized yet. Q: Dr. McHutchison could you please explain the Gilead Treatment program in developing countries? Q: How does this apply to sofosbuvir? “In hepatitis C we’re applying a similar approach to help ensure broad access to our hepatitis C medicines in developing countries. Our goal is to reach as many people living with hepatitis C as possible, as quickly as possible. We are pursuing various options to achieve this, including: voluntary generic licensing, direct negotiation with Health Ministries, tiered and dual pricing, as well as availability through non-governmental organizations. Tiered pricing for branded Sovaldi in low-, lower-middle and upper-middle income countries. We have three pricing tiers based on a country’s GNI per capita and hepatitis C prevalence. Because disease prevalence is considered, some countries classified as middle-income by the World Bank are included in our lowest pricing tier. The tiers serve as the starting point for negotiations with national governments and final prices are determined on a country-by-country basis taking into account each country’s treatment needs, healthcare infrastructure and the government’s commitment to expanding access to effective HCV therapy.Negotiations with high-burden countries are well underway, and in July 2014, Gilead signed its first HCV treatment expansion agreement with the Egyptian government, providing Sovaldi at our low-income price per bottle of $300 USD. Licensed generic sofosbuvir for developing countries Gilead has partnered with seven India-based generic pharmaceutical companies to manufacture and distribute sofosbuvir and the investigational single tablet regimen of ledipasvir/sofosbuvir for 91 developing countries (inc. 54 middle-income countries). More than 100 million people living with hepatitis C (representing 54% of the total global infected population) are covered by the agreements. Under the licensing agreements, the Indian companies receive a complete technology transfer of the Gilead manufacturing process to enable them to scale up production as quickly as possible. The licensees also set their own prices for the generic product they produce, paying a royalty on sales to Gilead to support product registrations, medical education and training, safety monitoring and other essential business activities. The licenses also permit the manufacture of sofosbuvir or ledipasvir in combination with other chronic hepatitis C medicines. Over 20 regional business partnerships to manage supply chains and distribute Sovaldi in developing countries. Registration of Sovaldi in developing countries, focusing initially on the highest-burden countries. For high-prevalence countries that require local clinical trials, like India and Egypt, Gilead is conducting clinical trials and submits applications as soon as results are available. Medical education to train healthcare providers in hepatitis C diagnosis and care. Secretary General of the European Association for the Study of the Liver. (EASL). The International Liver Congress (ILC) 2015, EASL’s flagship meeting, will begin April 22, 2015 and will be a very special meeting this time, since it will be an anniversary meeting in several respects. EASL is celebrating its 50th anniversary and will be celebrating half a century of unprecedented success in the fight against liver disease, where EASL is likely to contribute very significantly. At the same time, the Journal of Hepatology, EASL’s flagship journal will celebrate 30 years of existence and we are particularly proud about it reaching an impact factor above 10 for the first time in 2014. Thirdly, ELPA, the European Liver Patients Association celebrates its 10th anniversary and we are very happy about a fruitful collaboration that has allowed us to push liver disease-related issues forward together in public as well as with policy makers. Concerning the ILC program ILC, I think the Governing Board of EASL has managed to put together both a high profile scientific and educational program. The highlight of the educational program this year will again be the EASL Postgraduate Course, which will deal with non-alcoholic fatty liver disease (NAFLD), maybe the most important problem globally in liver disease after viral hepatitis and alcoholic liver disease. In addition to the Postgraduate Course, the program will be supplemented with Joint Workshops between EASL and a number of international medical associations in the field of liver disease, a selection of important educational topics in the early morning workshops, with clinical symposia, as well as the grand rounds. The scientific program is very exciting this year, as indicated by close to 2.800 abstracts submitted to the ILC. Again, we will see very important data of a large number of phase-3 trials of all-oral drug treatments for chronic hepatitis C. But while these trials will make much of the headlines, the ILC has to offer much more than just treatment of viral hepatitis. Non-invasive evaluation of liver disease, portal hypertension and also treatment of primary biliary cirrhosis will be the other highlights of the ILC, just to mention a few. From a public policy point of view, the highlights will be the EASL-WHO symposium looking at different aspects of improving the management of chronic hepatitis C in less privileged settings. Also, the joint workshop of the EASL Public Health Concerted Action Group will discuss specific aspects of improving management and access to care for viral hepatitis B and C.
I am sure that the program put together by the EASL governing board will be able to provide hepatologists with their professional needs as well as with a stimulating learning environment that will make the attendance at the ILC a very remarkable event. So I cordially invite you to join us in Vienna later this month and I hope that many will contribute to what we think will be a fantastic celebration of advancements in Hepatology over the past 50 years of EASL. Viral hepatitis is an inflammatory disease of the liver caused by infection with one or more of the five main hepatitis viruses A,B,C,D or E. Approximately 1.4 million individuals die each year from viral hepatitis and it is estimated that half a billion people are chronically infected with hepatitis B, C and/or D. Hence, viral hepatitis is one of the most important infectious diseases worldwide. The International Symposium of Viral Hepatitis and Liver Disease (ISVHLD) was first held in San Francisco in 1972 chaired by Girish Vyas with the aim of bringing together outstanding experts from clinic and basic research in viral hepatitis from all over the world to provide advanced understanding of diagnosis, prevention, control and treatment of the different hepatitis viruses. ISVHLD aims to establish dialogue between clinicians, basic researchers, industrial partners and this year for the first time public health experts from all over the world including developing countries and thereby support future research and collaborations to treat the urgent issues in the field of viral hepatitis. 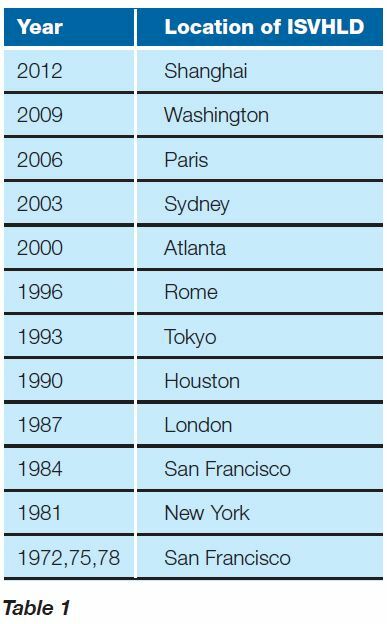 Since its inauguration in 1972, this ISVHLD symposium which is unique in its kind has moved around the continents every three years (see table 1). ISVHLD is the most important and most comprehensive as well as the most traditional of its kind. Over the years the topics reflected the most significant developments at the time in the whole field of viral hepatitis, including virus discovery, development of diagnostic procedures, blood bank screening, vaccine development and now therapies for chronic viral hepatitis B and C.
The ISVHLD has an international advisory committee (see table 2) that chooses the location for this tri-annual event and advises the congress organizers concerning the scientific program. Jay Hoofnagle (USA), a former president of ISVHLD, who introduced interferon treatment for viral hepatitis in 1986 is the chairman of the International Advisory Committee (IAC). The 15th edition of this tri-annual meeting will be held for the first time in Germany’s capital city Berlin from 26th to 28th June 2015 with Michael P. Manns as the congress president. Following the tradition of the Symposium there will be a combination of state-of-the-art-plenary talks given by outstanding authorities with talks based on submitted abstracts to be given by young and emerging scientists. Expert talks will include Stanley Lemon (USA) illustrating new insights about an old virus (HAV); Anna Lok (USA) summarizing the knowledge of HBV 50 years after discovery of HBsAg; Ralf Bartenschlager (Germany) reviewing the last 25 years in HCV research and how we have come from a replicon system to cure. An overview on HDV discovery and its role in medicine today will be given by Mario Rizzetto (Italy); new insights in the field of HEV will be summarized by Mohammed Khuroo (India); Stefan Wiktor (Switzerland) will talk about global control of viral hepatitis. Three sessions dedicated to hepatitis E underlining the growing importance of this hepatitis virus. One of these sessions will feature Harry Dalton (UK) who will outline the emerging concept of extrahepatic manifestations of hepatitis E and Nassir Kamar (France) will present new data on treatment options for hepatitis E. The hepatitis E sessions are generously supported by EASL. With the introduction of new direct acting agents against HCV, therapy has become much more efficient but also more complex and costly. Optimized individualized treatment strategies need to be developed and a focus on public health becomes increasingly important. Michael Manns the president of the ISVHLD meeting 2015 organized together with Stefan Wiktor (WHO) and John Ward (CDC) four sessions which will cover all aspects of public health including screening, control and elimination and broader access to treatment. The ISVHLD will take place in conjunction with the 12th HepNet Symposium of the German Liver foundation and the 1st International Translational Thematic Unit (TTU) Hepatitis Symposium of the German Center for Infection Research (DZIF). HepNet is a national network of competence on viral hepatitis founded by Michael P. Manns, Michael Roggendorf and Hans Peter Dienes in 2002 and was sponsored from its foundation until 2010 by the German Ministry of Research and Education (BMBF). This project is now carried forward by the German Liver Foundation (DLS) founded in 2006. During the 12th HepNet Symposium two whole sessions are dedicated to real-world data on hepatitis C. David R. Nelson (USA) will present data from the US TARGET cohort and Marc Bourlière (France) will present data from a French real-world cohort. The German Center for Infection Research DZIF is a newly formed BMBF funded virtual national institute that brings together experts in the field of translational research to develop novel and interdisciplinary approaches to control infectious diseases, among them viral hepatitis. During the 1st International Symposium of the Hepatitis Section of the German Center for Infection Research (DZIF) two major unmet needs in viral hepatitis take center stage. Ulla Protzer (Germany) features as one of several renowned speakers in the “HBV Cure” session; she discusses innovative approaches targeting cccDNA. In the “HCV vaccine session” Florian Klein (USA) presents insights from the field of HIV that shed light on the obstacles and opportunities en-route to an effective prophylaxis for these chronic viruses. Overall, 100 international experts from all parts of the world are scheduled to form the faculty as invited speakers of the ISVHLD 2015 conference. Young researchers will thus have ample opportunity to present their most recent data side-by-side with these prominent figures and come together for lively discussions. Moreover, there will be poster sessions to accommodate a broad spectrum of the latest insights in basic science, translational research, clinical aspects, prophylaxis and treatment in viral hepatitis. Young scientists will be supported to attend ISVHLD 2015. Scientists with an excellent abstract and accepted for presentation at the meeting will receive a travel grant. Abstracts will be blinded and reviewed by an international reviewer team which consists of the invited speaker and chairpersons of the meeting. ISVHLD offers travel grants of €500 to cover travel and accommodation costs to the presenting authors. Q 1: Professsor Mondelli, could you briefly explain to us what Ebola is? 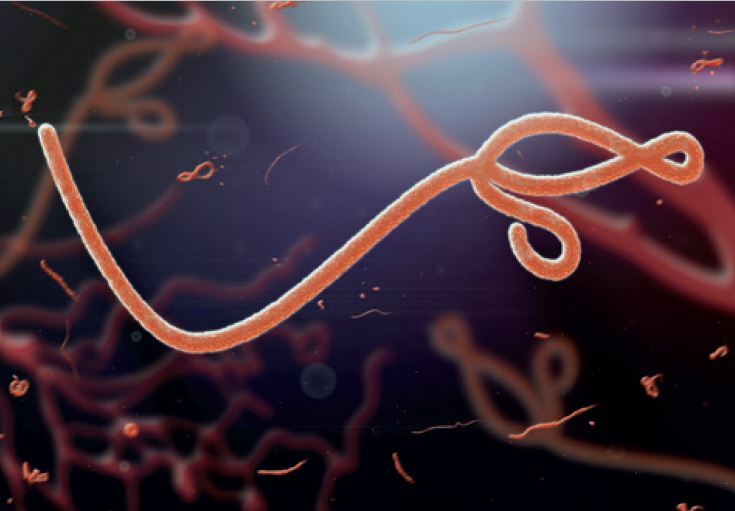 “The world is witnessing unprecedented, large Ebola virus infection epidemics which have taken a heavy toll on lives in West Africa with 9,177 deaths from a total number of 22,859 officially diagnosed cases at the time of writing this report. The disease has also reached the developed countries largely due to health care personnel being transferred there for treatment. Patient mortality currently still largely depends on healthcare resources and may vary from approximately 25% in developed countries to over 70% in the most underprivileged areas of West Africa, where the actual number of cases may be significantly underestimated. Q 2: What are the symptoms and what is the prognosis of the disease? “After an incubation period of 2-21 days (average 7-10 days), the patient develops non-specific symptoms that may be confused with malaria or dengue. This is followed by the emergence of gastro-intestinal symptoms and in severe cases, petechiae, conjunctival hemorrhage, epistaxis, gastrointestinal bleeding, shock and encephalopathy. Blood tests show evidence of leukopenia, thrombocytopenia, increased levels of aminotransferase, thrombin and partial thromboplastin times accompanied by the detection of fibrin split products indicative of the occurrence of disseminated intravascular coagulation (DIC). Q 3: Is the liver implicated in any way and can we hope for a cure in the immediate future? “Firstly no data exist on Ebolavirus infection on pre-existing liver disease However, the liver plays a central role in the clinical course of Ebolavirus disease and has characteristic histopathological features showing focal to widespread hepatocyte necrosis and apoptosis with minimal inflammation. Liver tissue available from necropsy also shows varying degree of steatosis and Kupffer cell hyperplasia together with mononuclear inflammatory cell infiltrates in the portal tracts. Hepatocytes may show characteristic intracellular eosinophilic and filamentous or oval virus inclusions, which represent aggregates of viral nucleocapsids. Liver pathology causes hepatic dysfunction with decreased production of clotting factors which represents the most ominous complication of Ebolavirus disease. Coagulation disorders are further compounded by thrombocytopenia and must be aggressively treated in an effort to save the patient’s life.